A significant outbreak of severe thunderstorms is likely across parts of the southern United States on Saturday. 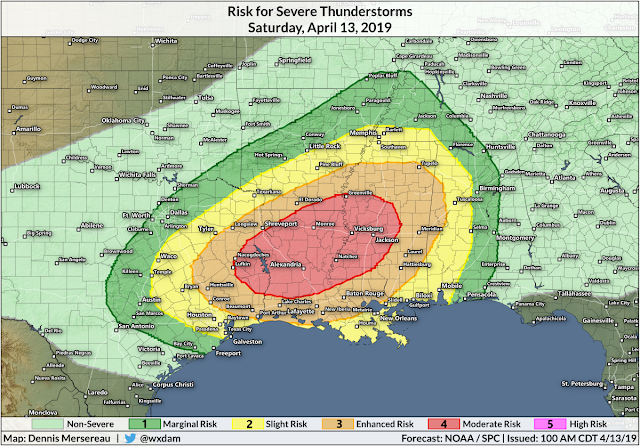 The Storm Prediction Center has issued a moderate risk for severe weather for parts of Louisiana, Arkansas, Mississippi, and Texas, which is the second-highest category on the agency's scale for measuring the severe weather threat. The environment in this part of the south on Saturday will be capable of supporting powerful supercells, or thunderstorms with rotating updrafts. Rotating updraft makes the storm stronger and more resilient than a "normal" thunderstorm. These storms could produce strong, long-lived tornadoes, destructive wind gusts, and large hail. The greatest threat for severe weather includes (or is very close to) Shreveport, Alexandria, and Monroe in Louisiana, as well as Jackson, Vicksburg, and Greenville in Mississippi. The outlook in this post was issued by the Storm Prediction Center at 1:00 AM CDT. It's a good idea to keep one eye on the radar all day and listen out for warnings if you're anywhere near this region on Saturday. The above image shows the tornado risk for Saturday. These may seem like small percentages, but they're relatively large in the grand scheme of things. The black hatching indicates the risk for significant tornadoes that could stay on the ground for a long time. It's important to remember that the severe weather risk isn't confined to just the high risk area. Much of the Mid-South and northern Gulf Coast are at risk of seeing severe thunderstorms today. A damaging wind gust or a tornado is dangerous no matter where it forms, so don't assume you're out of the woods if you're not in the predicted "bullseye" for this event. The highest-risk areas exist where the best severe weather dynamics are in place. There are plenty of cases where damaging tornadoes and particularly destructive squall lines formed well away from a moderate or high risk. A low-pressure system will move across central Texas during the day on Saturday, setting the stage for a round of dangerous thunderstorms to develop in the warm sector on the eastern end of the storm. Strong instability behind the warm front will allow severe thunderstorms to quickly develop across the risk areas on Saturday afternoon. The above image shows surface Theta-E, which is a great way to visualize different airmasses because it takes into account both temperature and moisture. You can easily see the warm sector that will fuel the storms on Saturday. Wind shear will drive the threat for tornadoes and damaging winds on Saturday. The combination of southeasterly surface winds blowing toward the developing low and upper-level winds from the southwest will create a region where extremely favorable wind shear will allow any storm that develops to quickly become severe. 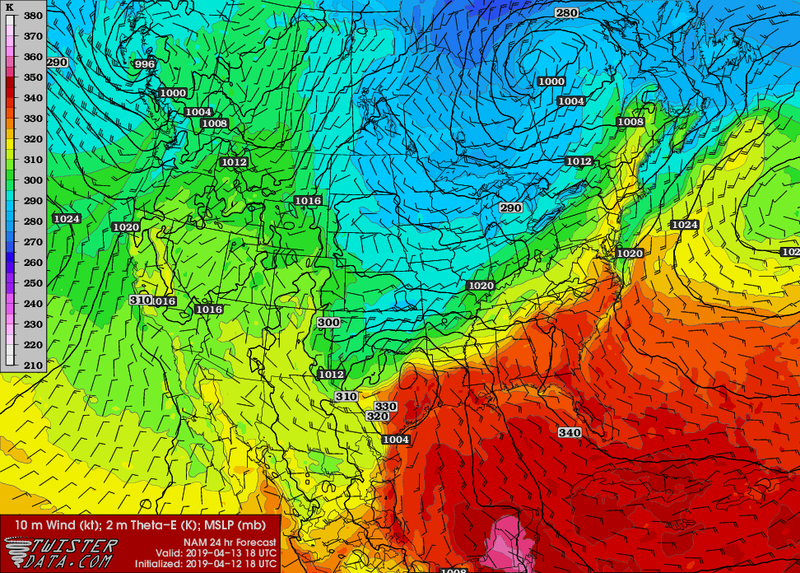 The above image shows the Energy Helicity Index (EHI) from the Friday evening run of the NAM. EHI takes into account both instability and wind shear to standardize the threat for supercells across an area. 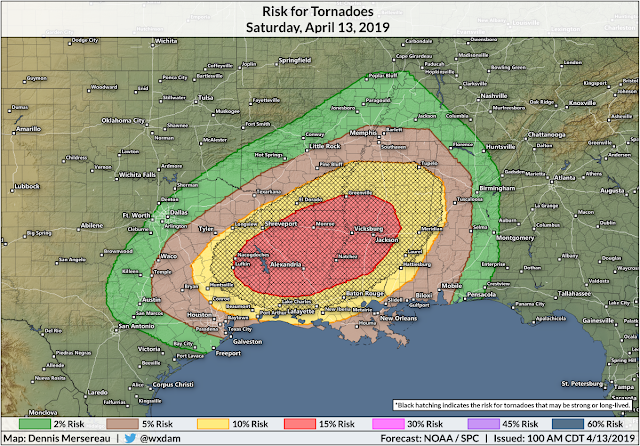 Values above about 3.00 are particularly concerning as they show an environment sufficient for supercells that could support stronger tornadoes. All of the factors are there for an explosive day of severe weather on Saturday. Instability, lift, ample moisture, lots of wind shear...checkmarks on down the list. But there are limiting factors that could determine who sees severe weather and how severe the thunderstorms will be. 1) Environments that are ripe for severe weather can falter because of ongoing clouds and precipitation that can limit instability. Several rounds of showers and thunderstorms developed over central and eastern Texas overnight into Saturday. These storms will move east and could linger in the risk areas through the morning hours. Any lingering thunderstorms will limit the ability of future storms to develop. The severe weather threat will depend on how much contamination there is from overnight storms. 2) Storm mode will determine how the day goes. The "storm mode" refers to the types of thunderstorms that develop. Squall lines carry a different risk than supercells. A classic tornado outbreak with textbook supercells on radar require clean, discrete thunderstorms that can fully engage with the favorable environment around them. If the storms form into clusters and squall lines, the predominant threat will be damaging straight-line winds with possible embedded tornadoes. The weather rarely follows textbook examples. It only takes one storm to break through and thrive. That's what happened in eastern Alabama back on March 3—there were lots of sloppy clusters of storms that day, but one supercell managed to find an opening and take off, producing an EF-4 tornado that killed 23 people. Most tornado safety tips are common sense. Seek shelter in the lowest level of a sturdy building and as close to the interior as possible. This is a swampy part of the country and not many homes have actual basements. The best place to seek shelter is an interior room like a closet or a bathroom. The goal is to put as many walls between you and flying debris as possible. "Stay home" is easier said than done. Make sure you mentally scout out a place to take cover at home, work, school, the grocery store, the library, wherever. Try to avoid big box stores on a day like this—those buildings are not built to withstand major severe weather and they will collapse like a house of cards when put under significant stress. Go somewhere else if you're in a mobile/prefab home. Many of those homes are not designed to withstand winds greater than about 80 MPH, some even less than that. 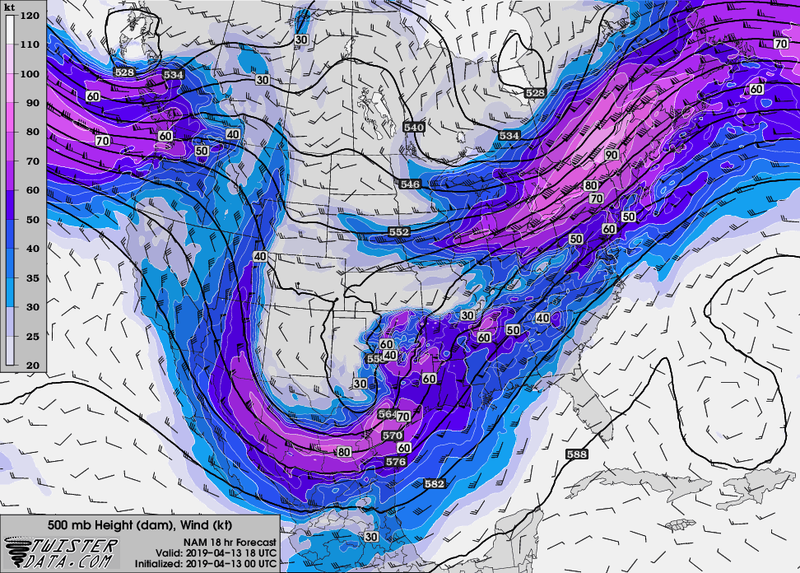 The environment on Saturday is capable of supporting tornadoes that could level even a well-built home. Some mobile homes that existed this morning won't be recognizable by nightfall. It's best to spend the day somewhere safe rather than waiting out the storms in a mobile/prefab home and then leaving at the last second. You probably won't be able to see these tornadoes, so there's no use standing in the window waiting to see one or, even worse, hopping in the car and heading on a makeshift storm chase. Many of these tornadoes will likely be wrapped in rain, making it nearly impossible to see them until they're on top of you. As it is, experienced storm chasers will have a hard enough time navigating the swampy, forested terrain looking for tornadoes that are probably socked in buckets of driving rain. Put on a bicycle or motorcycle helmet if you're taking cover during a tornado warning. Most tornado-related injuries and fatalities are caused by a blow to the head. It may look and feel silly, but looking like a goofball is worth it. On that note, it's a good idea to wear closed-toe shoes to protect your feet if you have to walk across any type of debris—broken branches, shattered glass, and twisted pieces of metal will tear up your feet and shred a pair of flip-flops. 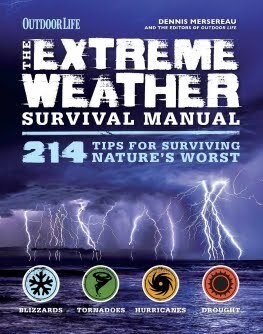 Make sure you always have a reliable way to receive severe weather warnings the moment they're issued. Tornado sirens are an unreliable source for tornado warnings—they're not designed to be heard indoors and they're exceptionally prone to failure. NOAA Weather Radios and emergency alerts on your cell phone are great ways to stay in the loop. A watch means that conditions are favorable over the next couple of hours. A warning means that threatening weather is imminent and will occur within the next couple of minutes. The Storm Prediction Center issues severe weather forecasts throughout the day. Local National Weather Service offices are responsible for issuing warnings that require immediate action.